Pianist Tianhong Yang became the second winner of the Ian Stoutzker Prize for Outstanding Performance in Music at RWCMD last night. Tianhong played her way to the £10,000 prize in front of benefactor Ian Stoutzker and a distinguished panel of judges, including Rebecca Evans, and chaired by John Fisher. 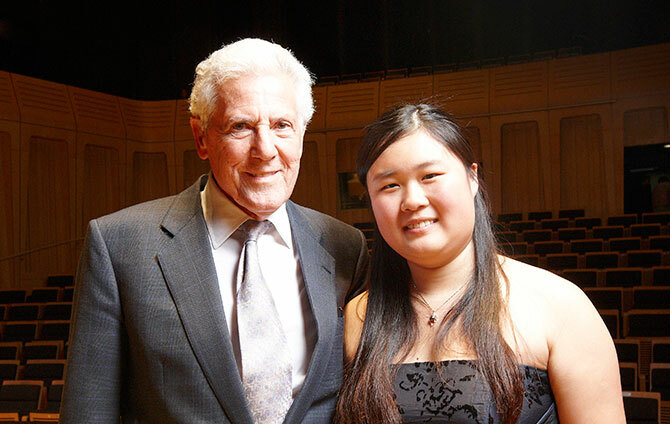 Tianhong’s winning repertoire included solo performances of Scarlatti, Chopin and Rachmaninoff, as well as Henryk Mikolaj Górecki’s Harpischord Concerto, played with the RWCMD Chamber Orchestra. Our congratulations also go to runners-up, Jemma Freestone, Vanessa Bowers and Lukasz Karauda.